Gartner Research's Hype Cycle diagram, by Jeremy Kemp. 27 December 2007. Used under a CC-BY-SA license. b) Push back against the disillusionment of a valid technology. 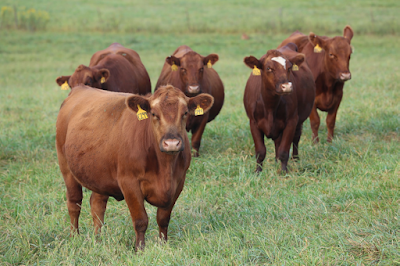 In previous decades new DNA technologies, such as microsatellites, AFLP markers, etc, lead to a lot of hype about how the beef industry was going to be radically changed by these DNA technologies. These were the "Technology Trigger" and "Peak of Inflated Expectations" in the diagram above. I've previously described that these single gene DNA tests completely under-performed compared to expectations. Consequentially, the "Peak of Inflated Expectations" was followed by the "Trough of Disillusionment". In this period of disillusionment, two important things happened. First, Meuwissen, Hayes, and Goddard proposed a new way to use DNA markers to predict genetic merit. Rather than looking at individual genes, they suggested we use markers throughout the genome to account for 100% of the animal's DNA in these genomic predictions. Unfortunately, in 2001 the technology and capability to simultaneously test enough markers was not available. But, in 2007 a group of universities and the USDA developed a DNA panel that was release by Illumina in 2008 as the BovineSNP50 BeadChip. With this technology we could now simultaneously test over 50,000 markers evenly spaced throughout the genome. Genomic selection was implemented within the dairy industry in 2009, and later several beef breed associations followed suit. Genomic prediction works, as the dairy industry has shown. From Brian Van Doormaal, 2012. 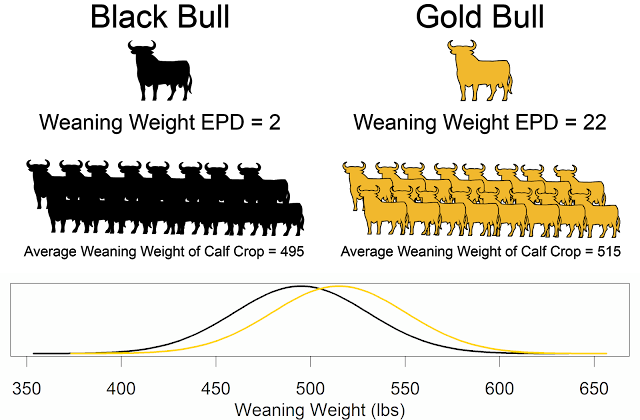 Increased Rates of Genetic Gain with Genomics. Canadian Dairy Network. The rate of genetic change visually increased with the start of genomic selection in 2009. I would guess that the dairy industry is somewhere between the "Slope of Enlightenment" and the "Plateau of Productivity". Hopefully, the beef industry will leave the "Trough of Disillusionment" and start the trek up the "Slope of Enlightenment". To do this, we need to have genomic tests at price points that allow broad application within the industry, genomic tests which explain a large portion of the genetic variance, and explanations to help producers understand when and how to use these technologies. Bottom line. Genomic selection works. And that is no hyperbole. p.s. For those of you needing some entertainment and encouragement. Enjoy. The beef industry is much more genetically diverse than the dairy industry, and that is a good thing(ask dairymen). It will take much more testing to establish the markers that represent the traits in the many different genetic lines of the beef industry. Don't use a race toward some established genomic standard to destroy the beef industries diversity.